He was a writer of codes and ciphers and cryptograms and x-ray reports engaged in ceremonial rite-ing and the righting of various racially determined wrongs through his low-down-and-dirty blues undertones, chromatic breaks, and mock-classical choruses. 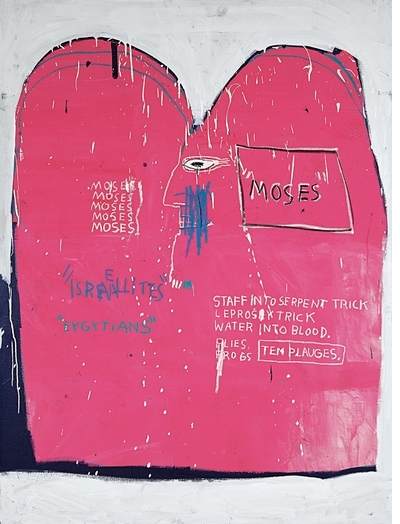 A radical actor upon the murder scene of a thrown-away kulcha resurrecting itself with moxie and funny money, an artful dodger of a post-disaster suddenly awash in junk-bond nouveau riche traders and seductively predatory gallerists. 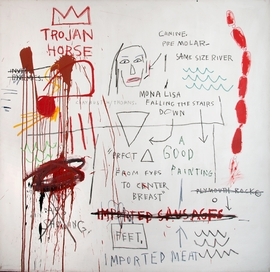 Featured image is reproduced from Jean-Michel Basquiat: Words Are All We Have. 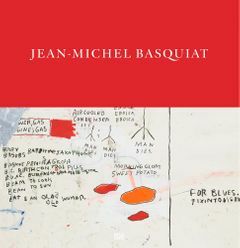 A dazzling collection of major works.... his work never lost its reckless disregard for the border that seems to separate art and writing. 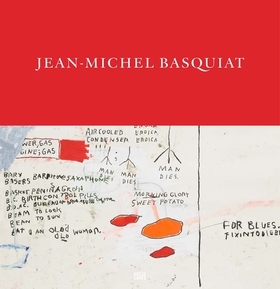 A profound and prophetic study of the artist as philosopher, painter, and poet. FORMAT: Hbk, 10.5 x 12.25 in. / 208 pgs / 103 color.